Two years after launching its record breaking 200GB microSD card SanDisk is back with a fast new mini flash storage card offering twice the capacity. 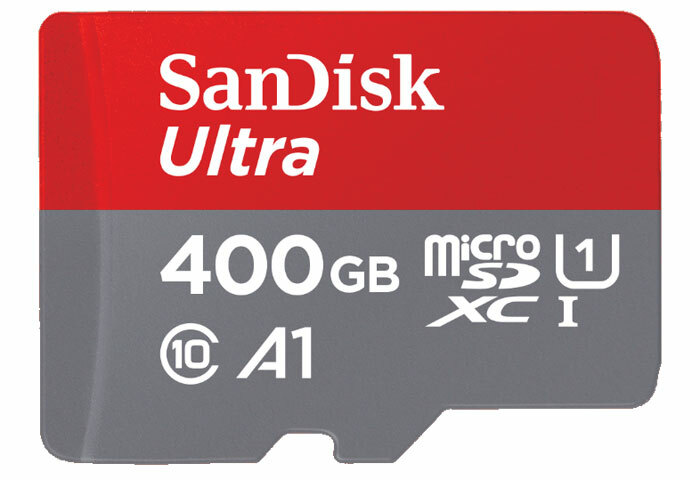 The 400GB SanDisk Ultra microSDXC UHS-I card doesn't appear to be orderable or even pre-orderable right now, however parent company Western Digital Corporation says that the capacious new memory card will come with an MSRP of US$249.99. SanDisk reckons its new Ultra 400GB microSD UHS-I card is ideal for Android smartphone and tablet users who like to capture or carry around lots of data. On the capture side, lots of people are now recording 1080p and 4K videos on their phones which come with hefty file sizes. On the media library side, some users like to carry around libraries of TV show box sets, films, and music collections. 400GB on a single fingernail sized card sounds perfect for such heavy users. Such a large capacity card needs to be able to offer fast transfer speeds. SanDisk claims that its new 400GB microSD card can transfer files at up to 100MB/s, which it chalks up as equivalent to moving approx 1,200 photos (4.1GB of data, average photo size 3.5MB) in a minute. Its class 10 rating means this memory card is capable of direct to memory card full HD video capture - depending on the host device capabilities, of course. If you have an Android device capable of installing apps and games to its microSD card you might also be happy to know that the Ultra 400GB microSD UHS-I card is both compatible and A1 rated. Faster app launches and performance are promised if a memory card has an A1 rating. SanDisk also sells Ultra microSD UHS-I cards in capacities of 16, 32, 64, 128, 200, and 256GB. All the cards work with the SanDisk Memory Zone app for Android which facilitates back up your phone's files and more. They all come with an SD adapter.